Viral respiratory infection affects the throat, the airways and the nose. It might be caused by different viruses. The most common viral respiratory infections are influenza and common cold. Runny nose, cough, irritability, scratchy throat and nasal congestion are some common symptoms of viral respiratory infections. Practicing good hygiene is one of the best ways of preventing viral respiratory infection. Routine vaccination is also helpful in preventing influenza. These infections are of two types namely upper respiratory tract infections and lower respiratory tract infections. The common viruses that cause these infections include rhinovirus, coxsackie virus, adenovirus, respiratory syncytial virus and parainfluenza virus. Nasal decongestants are of good help in improving breathing conditions in people suffering from viral respiratory infection. However, they might be ineffective if used on a regular basis. excessive use of nasal decongestants can also result in rebound nasal congestion. Analgesics such as NSAIDs and acetaminophen can also be of good help in reducing aches, pains and fever caused due to viral respiratory infection. Viral respiratory infections need not be treated with antibiotics and medicines for fever and pain. This is because medicines are not always effective in treating the symptoms of viral respiratory infection. People with viral respiratory infection require additional rest. It is also important for them to maintain proper intake of fluid in order to keep the body healthy and functioning properly. Some people might also benefit from the use of expectorants, zinc, vitamin C and cough suppressants. 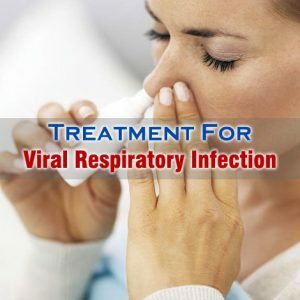 This is probably one of the best options for viral respiratory infection treatment as it can work wonders for the condition within a very short span of time. Gargling with salt water and steam inhalation are considered some of the safest ways of getting good relief from the symptoms and the discomfort caused due to viral respiratory infection.